The Somerville Support Services Facility project was undertaken by the Harvard Art Museum in 2008 and is a fit-out of 66,101 square feet of leased shell space at 200 Inner Belt Road in Somerville, Massachusetts. 200 Inner Belt Road is a four-story commercial building originally constructed in 2001. 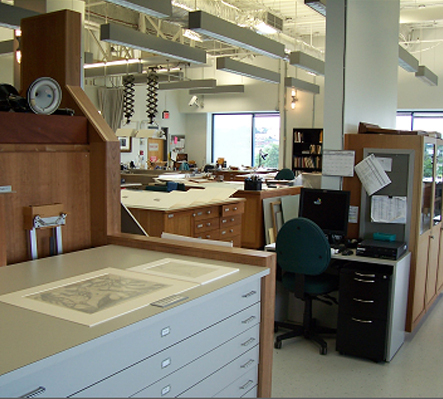 The space contains collections storage, compact and refrigerated storage, curatorial and administrative offices, archives and research centers. Limited exterior work was performed to augment the rooftop HVAC system and replace conservation lab glass. Approximately 104 Harvard Art Museum employees occupy the second, third, and fourth floors in the north end of the building while the 32 Quincy Street facility in Cambridge, the former Fogg Art Museum and Busch-Reisinger Museum, undergoes a historic renovation. After completion of the 32 Quincy Street project, many of the occupants will return to Cambridge while roughly two-thirds of the Somerville space will remain occupied.